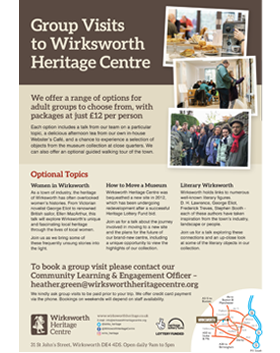 We welcome group visits to the Heritage Centre, although groups of over 10 people are advised to book in advance. We offer a range of activities for groups of all ages. We can offer a guided tour of the Heritage Centre, a sit-down talk by a member of our team, and/or a guided walking tour of the town. 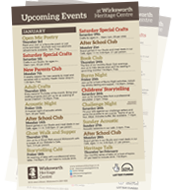 Please contact our Community Learning & Engagement Officer – heather.green@wirksworthheritagecentre.org for details. We kindly ask group visits, tour and talks to be paid prior to your visit. We offer credit card payment via the phone. Bookings on weekends will depend on staff availability.